I’ll update this post with relevant and interesting analysis as it comes up. Update: People have asked about the impact of ENSO. In the following figure I took the ONI index and found the lead with the greatest correlation to the monthly GISTEMP values (2 months), regressed that out, and recalculated the annual means. Ignore the ‘MEI’ labels, it really was the ONI index. Let’s see if I can get this in before Al Rodger! December came in at a sizzling 1.12C anomaly, resulting in a 2015 annual record-warm mean of 0.87C. The former NCDC data set has those numbers at 1.11 C and 0.90 C, respectively, which is also the warmest ever measured. Damn, this hiatus has gotten warm. After a long hiatus (a real one) I’ve relaunched the Deep Climate blog. [T]he discrepancy between very short-term and multi-decadal trends in the observations appears to have been exaggerated in prior estimates, including IPCC AR5. Congratulations on completing the GISTEMP date for December and 2015. Ominous…. There is, of course, an El Nino in progress but whatever that’s doing and will continue to do to temperature in the coming 12 months, it doesn’t detract from the 2015 heat. Slightly off-topic but maybe Gavin will respond. Is there a problem with access to GISS at present? I am getting timeouts – not just GISTEMP but the GISS site as a whole. Colour me cynical but the joint NASA/NOAA statement about 2015 goes up and GISS seems to have gone off the air. Hmmm… DOS Attack anyone? Anomaly World in December 2015 – shock! For the first time since the beginning of the century (here at the Center Pertini we are very careful and we have every single monthly data stored electronically) a month ago to record a thermal anomaly, of course positive, global (that refers to the entire planet, land + waters) UPPER Celsius degree, exactly +1.11 ° C above the average of the 20th century! Specifically, in December 2015, the Earth’s temperature was +13.31 ° C, just 1.11 ° C more than the value adopted as the medium. Let’s face it: it is a huge amount! It makes you think and worry. But there is a side that dissolves, at least partially, this concern: in December, it was said a long time, it might have been more influenced by the month that global radiator which was and still is the Nino 2015, an exceptional event, of great power and great durability. In my opinion in January it could also further tweak the thermal anomaly, and maybe (but I stress maybe) even months, but then it should be reduced even more during the remainder of 2016, returning to pre-Nino. At least, we hope so, otherwise really have to get to the bedside of the planet and find a cure convincing! Even the year 2015 obviously broke the all-time record, with the final figure that does mark a thermal anomaly overall positive 0.85 ° C with the temperature of the planet assestatasi to +14.75 ° C.
For some time now people have been saying that following the 2015 rise in global temperatures, we’d start to hear the denial meme, ‘no warming since 2015’ (or 2016). In fact, if 1998 was anything to go by, I think that’s at least 5 years off. For the moment, I’m starting to hear the suggestion from the usual quarters that 2015’s record heat is all down to El Niño—with the implication that this is just a temporary blip in the ‘pause’. Can I suggest it’s always made undeniably-clear that El Niño is simply a contributing factor. I wonder to what degree the increased transfer of thermal energy to the deep ocean, esp. the Pacific, will exaggerate El Niño years and produce more ‘outliers’ like 1998 and right now. Thanks Gavin for a great presentation. I have a question about slide 10. At the bottom of the slide you list the ranking of 2015 for each atmospheric layer. If I match this up with the RATPAC-A data set here, it agrees exactly. Can I conclude from this that RATPAC was indeed the radiosonde data that is referenced here? Or were other data sets averaged in with the RATPAC data? It’s interesting to see that the surface data for 2015 shows a whopping 0.28C increase over the previous year, but I presume this is biased more to NH land data. Is that correct? Also if I look at the 800 – 350 mb data here then 2015 is clearly the warmest year for the Globe contrary to the satellite TLT data. Why not show the 850-300 mb data set in the presentation? thanks for the sobering post. Quick question: Why the climate normal 1951 to 1980 for the top graph rather than, for example, 1981 to 2010? I just saw a headline on MSNBC that said 2015 was the second-hottest year on record. Anyone know where that came from? So the El Nino explanation is a bit lacking in power, to put it kindly. If you tell me exactly what you mean by the word “pause” i can tell you whether there is one in the data. Same holds for the word “trend”. That takes the fact that it’s an El Nino out of the running as an explanation for this particular record. And it doesn’t leave much room for a rebuttal (“But what about the non-El Nino years?”). Thanks to Gavin & team for swiftly (and concisely!) answering my Reddit questions about the Arctic. However I’d still like to pursue the satellite/radiosonde angle from slide 10, if I may. The denialistas are currently bleating about “2015 wasn’t hottest according to the satellites!!!”. Hence my question: What precisely (if possible!) is being measured and then summarised in slide 10? Welcome back DC. Particularly since your latest article addresses some of my concerns about “coverage bias”! There seems to be a labeling error in the “Was there a pause” animation. The dotted line is labeled “continued to 2015” which implies it’s 1970-2015, which is what the green line is. Perhaps the dotted line is 1997-2015 trend? What stands out to me on the GISTEMP Annual 2015 graphic is that the only areas of the planet with cold anomalies are near the ice caps (Greenland, Patagonia, and Antarctica). I know I’m not the first to notice, in fact I have seen some discussion on other sites of the persistent cold pool in the North Atlantic near Greenland. But most of those discussions used the NOAA graphics which don’t show much around Antarctica. I only check in on this site every now and then, so I may have missed it. Can anyone point me to any scientific discussion, analysis, or explanation of the cold pools near the ice caps, on this website or elsewhere? Thank you in advance! @18 (Dan Miller): The dashed line is just taking the trendline from 1970-1997 and extrapolating that line. The green line is fitting a new trendline over the period 1970-2015. Is there a “pause” or “hiatus” in warming? Has warming slowed compared to the long-term warming trend? Has warming lagged behind model-derived expectations? What physical mechanisms underlie the “hiatus”? That helped me understand what is meant by “pause”. The first two questions are primarily statistical, while the second pair of questions are about our knowledge of the physical mechanisms of climate. In this article, a simple and logical definition of trend is given for any nonlinear and nonstationary time series as an intrinsically determined monotonic function within a certain temporal span (most often that of the data span), or a function in which there can be at most one extremum within that temporal span. ‘Pause’ refers to an apparent slowdown or stall in global temperature rise from 1998. Critics typically refer to the Remote Sensing Systems [RSS] satellite record of temps in the lower troposphere. Here’s the data. For the other well-known satellite data set, University of Alabama, Huntsville [UAH] you can use the official version (1), and the next version, Beta 6.4 (2). If you want to experiment with surface thermometer data sets, try these, 1998 – 2014. The Antarctic cooling I think is more complicated and has several articles on it. As mentionned in earlier comments, the influence of the current El Niño will be stronger on 2016 than on 2015, independent of the time lag being 2 months (in Gavin’s calculation) or 4 months (e.g. in Foster/Rahmstorf 2011 for GISS data), see also the Graph of MA Rodger in comment 4. 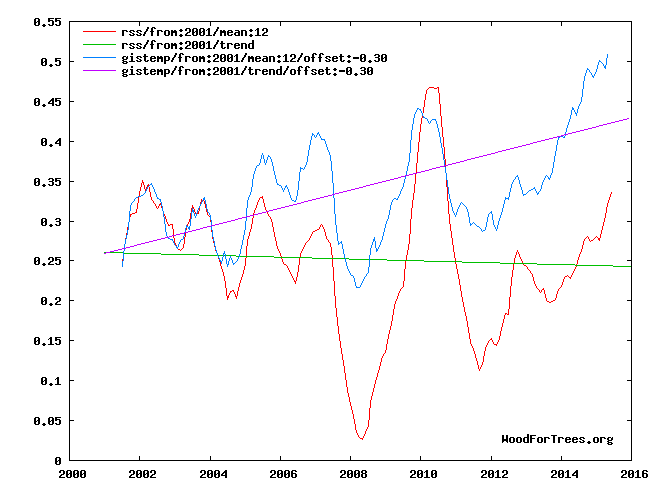 The record years in global temperature always follow the El Niño winter (1998, 2005, 2010). The 1998 value was the “result” of El Nino starting in summer 1997 and ending in summer 1998. Since the ENSO index already between summer 2014/summer 2015 was positive and therefore increased GT in 2015 a bit, 2016 will probably not stand out as much as 1998, but still… for sure I’d bet that 2015 will not be a standout peak like 1998. There’s a high probability that 2015 will hold the record for one year only. Thus, with regard to global temperature, 2015 is not an “El Niño year”. 2016 will be the El Niño year that you should compare to 1998, 2010, etc. Furthermore, the fact that 2014 and 2015 were so warm without being typical El Niño years leads to a number of interesting quetions concerning the reasons of the previous “hiatus”. There were a number of reasons proposed to explain the weakening of the warming, which each of them were purported to partly of fully explain the missing warming (low ENSO index, low solar maximum, more aerosols, ocean warming, data coverage, etc.). If all of them had been real, they’d have together explained the “missing” warming two or three times. That means, probably not all of them might be appropriate. If we assume, that we are somehow “back on track” now, even without El Niño, we can look at these factors that were proposed to slow the warming, and see if they have changed recently. Solar radiation hasn’t, ENSO has but seems to be only part of the game, data coverage hasn’t. What about aerosols and ocean warming? Well, 2 years might be too short a time, but it might still be interesting to include that in the discussion. However, if data coverage really explains the hiatus, and if we are now back in the “old” trend, and data coverage hasn’t changed, where are we really with global temperature? We should point out that the cold spots around Antarctica and Greenland are likely indicating thaw-freshwater runoff. Although the tick-tock of individual months is a bit trivial now the year is over and the annual anomaly is known, here are the NOAA & GISS rankings for the months of 2015. (For those curious about the differences in these rankings, as the 2015 values demonstrate, the two temperature records do disagree from month to month with an average difference of something like 0.05ºC. So some discrepancy should be expected. As GISS is wobblier month-to-month than NOAA, in this circumstance of continually pushing for top spot, NOAA with the less wobbles requires less of a margin to achieve a full slate top-slots. What is the probability of 2016 being as warm if not warmer than 2015 if the additional warmth is 75% ACC and 25% El Nino as I think it has been stated. Bear in mind that runoff water falling through a moulin gains ~ 1 C per 200 meteres of fall, so meltwter originating atop a high icecap melts more along the way , and depending on transit time, may exit at sea level warmer than its icy surroundings. Well, there’s more than just one thing going on. Get a load of Delingpole’s spin on the subject ! Wut dowedo f 16 jmps agaiiin? Care to hazard an educated guess? #33–Wow, I’m impressed. Delingpole actually knows how to use WFT to compare trends. Kind of makes it less likely that his untruths are accidental, though. HadCRUT also now in for December. Their final monthly anomaly for 2015 sits even more dramatically than that for NOAA or GISS. NOAA….. Jan 2nd,1st,1st,3rd,1st , 1st,1st,1st,1st,1st,1st,Dec 1st. HadCRUT4 Jan 2nd,3rd,2nd,3rd,1st , 1st,1st,1st,1st,1st,1st,Dec 1st. Over the course of a few months this past summer, Antarctic sea ice extent shifted from a recent pattern of being about 1M km^2 above average to hovering right about at average. Is this likely to be related to the current El Nino, or is it more likely just coincidence? The last 4 years to 2015 had an increasing rate of change anomaly which is a bit concerning. I hope this current trend slows down or we are going to hit 1.5C very soon. I have been closely watching the ocean temp anomalies for quite a while using null-school and the 2+C warm pools seem to be growing. As the current el-Nino is showing the first signs of disintegration other warm pools are springing up. Do politicians really understand that we are past time to inact a tangible reversal of GW. I am not a accredited scientist and yet I can clearly see the dire urgency of the situation. Must see video: How can it be so cold if there’s global warming? 7- “we’d start to hear the denial meme, ‘no warming since 2015’ (or 2016). In fact, if 1998 was anything to go by, I think that’s at least 5 years off.” You may be right – you won’t likely hear:” Stop the presses! No global warming for 3 weeks now!”. So for now we are stuck with the traditional “The least-squares linear-regression trend on the RSS satellite monthly global mean surface temperature anomaly global warming for 18 years 8 months since May 1997” (http://www.climatedepot.com/2016/01/12/satellites-no-global-warming-at-all-for-18-years-8-months/). And when to mention to them that the El Nino of 2015 finally allows comparing apples with apples (i.e. strong ElNino of 2015 with the strong ElNino of 1997/1998), then the fall back position is to claim that the 2015 data were fabricated by the climate lobby standing to gain on this fabrication “hundreds of billions of dollars” (a quote from a certain Professor of Plant Sciences). Gavin, could you spare me a few millions? While I have read comment that the recent drop in Antarctic SIA results from El Nino, I’m not sure how authoritative such comment actually is. If I look for such drops during previous El Nino events, I don’t see them. SIA has pretty-much been wibbling-&-wobbling its way on a gentle upward trend since the satellite data began. What you describe as being “a pattern of 1M km^2 above average” was more the top of a rather large wobble that began in 2011 and over the last couple of years has been setting record high SIA anomalies (much to the delight of some). Indications of a rather dramatic end to this large upward wobble first appeared about a year ago, dramatic enough for me to wonder if the satellite was losing its sensor. This proved to be the end of the big wobble’s upward trend. Its later drop in the middle of last year was dramatic – from second highest anomaly (for time of year) at the start of July to briefly setting the lowest anomaly (for time of year) 40 days later. There is a presently up-to-date graph of SIA here (usually 2 clicks to ‘download your attachment’) showing the rolling annual average & a trend line which illustrate these wobbles perhaps better than the Cryosphere Today graphs. None of the wobbles appear to coincide with El Ninos. Thanks. That’s pretty much what I thought, but the drop last summer was so pronounced I wondered if some major driver (El Nino?) was associated with it. Some of the more predictable Op=-ed cartoon responses to GISS 2015 are compiled here. I understand that one weather incident is never to be taken as a climate trend; so, how do ‘we’ interpret an individual event that could have long term consequences? For example, the 38(?) hour warm spell before Christmas, the temperature rose just enough to stall ice growth around the north pole. Knowing that both annual and multiyear ice are thinning considerably, is such an event just another example of why the polar ice is in its current state of flux; or, was this just an extraordinary event associated with the bizarre weather of this winter (which may or may not be an example of global climate change)? Maybe, our world now a days is changing because of us. “Because of us” why? because of our carelessness, we don’t know how to take care of it. Some of us knows how to take care of it but they just don’t do it they seems to be blind at all. Maybe, our planet earth was a billion years ago living and it’s counting we must know how to take care of it even in a small way just like throwing trash at the proper place. Our ozone layer now is too thin and it is continuously being destroy we can prevent this by simply planting more trees and stop burning plastics. Because of that some reasons I stated our temperature here in our planet earth is getting too high much more than the previous past years.